If this question ever bothered you, then you crashed at the right webpage! Today we are going to find out that why top pinhole of a socket is bigger and thicker than rest of the two pinholes. In this post you will find the simplest explanation of Why Earth pin is made thicker and bigger than live and neutral? Now at some point in your life, this question must have bothered you. But don’t worry, today we are going to go deep to find out the reason behind it with step by step explanation of Why Earth pin is made thicker and bigger. If you go to any place around the globe, you will find the same concept behind every three pin-plug or socket which is: Top pinhole of a socket and top pin of three pin plug is bigger as well as thicker than the rest of the two pins. Now let’s assume that all three pins of the three pin plug are of same size and diameter.Since all three are of the same thickness, in case of the wrong plugin if you touched the metallic part of electric iron’s body; you will definitely get a shock. Due to the fact that earth pin is directly attached anywhere on the metallic body, if earth pin is inserted in the live hole, current will flow from the live wire of socket to the earth pin of Iron to the metallic part of the iron’s body. Let’s take the example of an Electric iron again. A. When the plug is inserted in socket, earth pin makes connection to the earth hole of the socket prior to live and neutral. Thus the earth connection is made before the current carrying contacts of the plug become live to prevent us from any kind of electric shock. B. 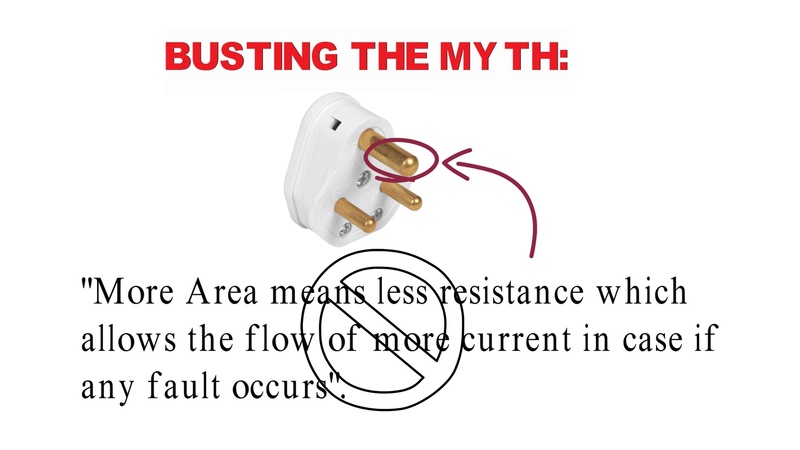 Opposite is the case when the plug is withdrawn from the socket; Earth pin comes out last. And thus when withdrawing the plug, the current carrying contacts shall separate before the earth connection is broken. NOTE: Thus as you can see plug of electric appliances and sockets in our homes are designed so, to ensure our safety in every possible way. So with that being said, now you know exactly why Earth pin is made thicker and bigger than live and neutral? LDR Working: How an LDR or Photoresistor Works ?